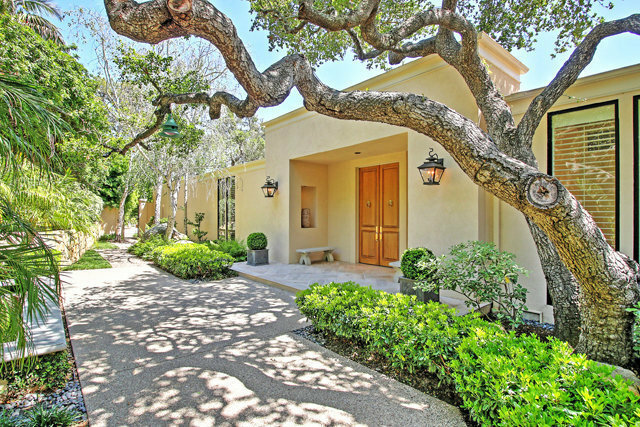 Elegant Hollywood Regency Contemporary Neoclassical, An Ultra Private Garden Paradise. Architecturally Designed by Stan Riffle & Remodeled by Dennis Woodson with DD Ford Construction. An Exceptional Home Resting Naturally Among Native Oaks & Drought Resistant Plantings with a Southerly Exposure. The Sophisticated Interior Design Blends Comfortable Living Spaces with Outdoor Living though Walls of Glass and French Doors. An Ideal Floor Plan with Sumptuous Master Suite & Den in one Wing. All Living & Entertaining Spaces are open & have easy Access to Multiple Sunny & Shaded Patios, Ideal for Alfresco Dining. An Open Rotunda Dining Room is Conveniently Located off the Kitchen through a Butler's Pantry. Open Chef's Dream Kitchen with Triangle Island is Equipped with Fine Appliances & Accesses an Outdoor BBQ Patio. The Separate Guest Wing has a Large Bedroom Suite & Handsome Paneled Den/Library. There is a beautifully Finished Large Garage & Stand Up Basement. This Special Property is Ideally Located on a Private Drive in One of Santa Barbara's Most desirable Micro Climates.